Considering the possibility of a truly proletarian art, the great English literary critic William Empson once wrote, “the reason an English audience can enjoy Russian propagandist films is that the propaganda is too remote to be annoying." Perhaps this is why American artists and bohemians have so often taken to the political iconography of far-flung regimes, in ways both romantic and ironic. One nation’s tedious socialist realism is another’s radical exotica. The artists themselves were completely unaware that their work was being used as propaganda. 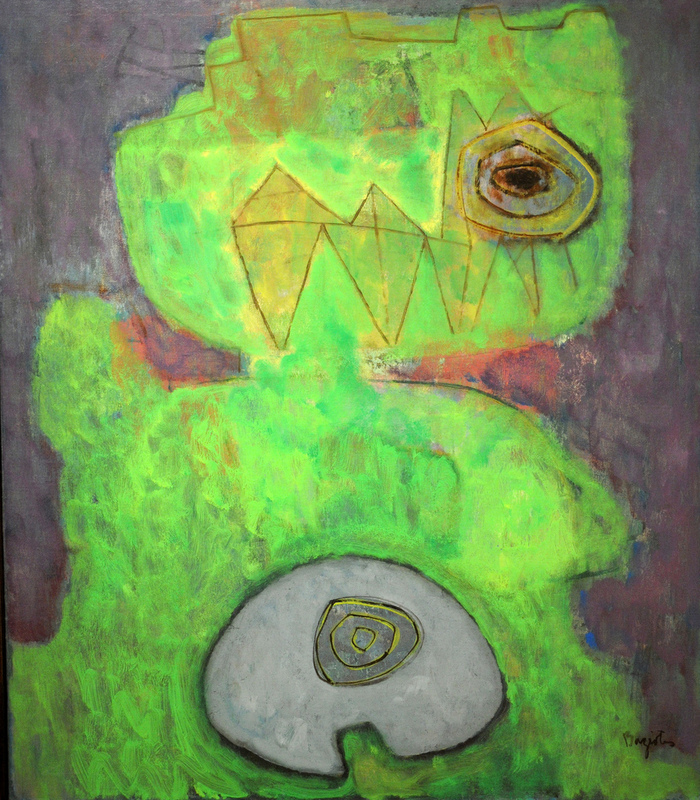 On what agents called a “long leash," they participated in several exhibitions secretly organized by the CIA, such as “The New American Painting” (see catalog cover at top), which visited major European cities in 1958-59 and included such modern primitive works as surrealist William Baziotes’ 1947 Dwarf (below) and 1951's Tournament by Adolph Gottlieb above. In the 1950s and 1960s… the great majority of Americans disliked or even despised modern art---President Truman summed up the popular view when he said: "If that's art, then I'm a Hottentot." As for the artists themselves, many were ex- communists barely acceptable in the America of the McCarthyite era, and certainly not the sort of people normally likely to receive US government backing. This philistinism, combined with Joseph McCarthy's hysterical denunciations of all that was avant-garde or unorthodox, was deeply embarrassing. It discredited the idea that America was a sophisticated, culturally rich democracy. The one-way relationship between modernist painters and the CIA---only recently confirmed by former case officer Donald Jameson---supposedly enabled the agency to make the work of Soviet Socialist Realists appear, in Jameson’s words, "even more stylized and more rigid and confined than it was." 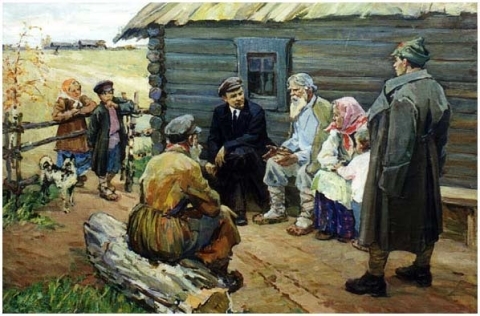 (See Evdokiya Usikova’s 1959 Lenin with Villagers below, for example). For a longer explanation, read the full article at The Independent. It’s the kind of story Don DeLillo would cook up. William Empson goes on to say that "a Tory audience subjected to Tory propaganda of the same intensity" as Russian imports, "would be extremely bored.” If he is correct, it’s likely that the average true believer socialist in Europe was already bored silly by Soviet-approved art. What surprises in these revelations is that the avant-garde works that so radically altered the American art world and enraged the average congressman and taxpayer were co-opted and collected by suave U.S. intelligence officers like so many Shepard Fairey posters. So the CIA was more cultural savvy than most Americans of the ’50s. by people who wanted to control the sugar cane beetle. It has no natural predator and has dramatically altered the ecology here. It is now recognised as a threat to the natural system. I think Abstract Impressionism was (is) like a cane toad. Far too common, ugly as all hell, and not welcome. Culturally savvy indeed! Weren’t russians about to try the same with their vanguard just before realistic socialism hit? Some info on that would be great! LOL! This article really made me laugh, not because I disbeleived it but because I find it entirely plausible. Abstract expressionism is faux-art and could only have been maintained with the CIA funding making it appear to be legitimate art. The commercial “art world” is a gigantic hoax of social engineering. Shrewd move by the CIA. It was a war of ideas. The freedom artists enjoy elsewhere to be original and daring did not pass unnoticed inside the Iron Curtain. This article is a CIA whitewash itself. The artists weren’t on any long leash, and the CIA itself blew their cover back in the 1960’s. See agent Tom Braden’s article in the Saturday Evening Post, or the articles in Ramparts. Even the 1995 article by Saunders that Josh Jones links to admits that. Saunders book shows you that all these artists were part of the propaganda program that is still going on. You don’t have to be an artist to recognize crap when you see it. Oh, why bother? You are the one who thinks “the Government” blew up the Twin Towers on 9/11. Your take is that most of whole world is a whitewash or cover-up of one kind or another. Was Physics Taken Over By The Intelligence Communities? “Fake-killed”? “Pi is 4”? “video of the planes going into the towers was faked”? And you wonder why only kooks take you seriously? My previous post was a reply to Miles Mathis. Where is the proof that the exhibition The New American Painting was funded or promoted by the CIA? Please name your source. 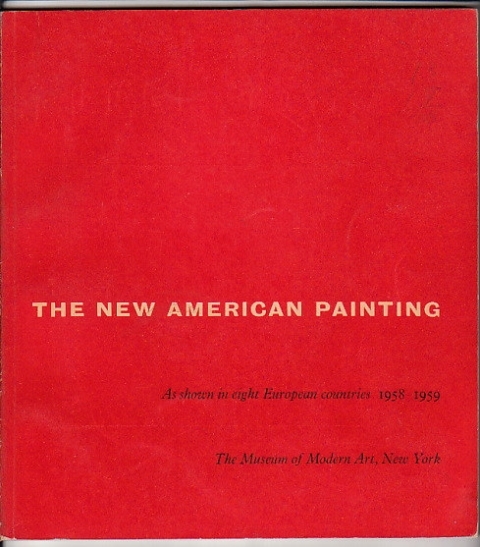 Far from being unknown, there was an extensive article regarding this in Artforum in 1974, written by Eva Cockcroft, entitled “Abstract Expressionism, Weapon of the Cold War.” Based on FOIA requests, the article should have caused a reassessment of the historical narrative, but by then the art market and the inertial weight of cultural investment worked to obviate that possibility. 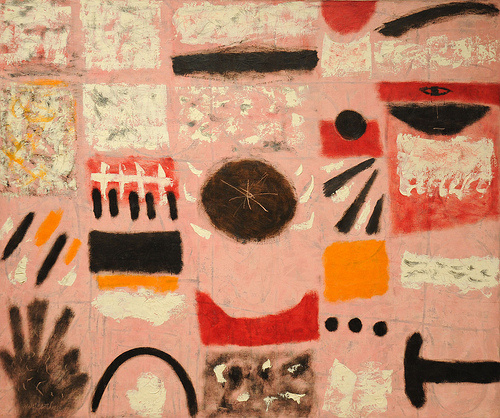 Please check “How New York stole the idea of modern art” by Serge Guilbaut. I always thought the Intelligence community and industrialists like Hearst and Rockefeller were unnerved by the power of art as a tool of political change. The powerful art coming out of Mexico, Rivera, Orozco etc was deemed dangerous. Therefore they decided to promote a form of art that by its very nature lacks any meaning or any power of influence over the viewer. The mural that Rockefeller commissioned Rivera to paint in the new Rockefeller Center contained a portrait of Lenin. Rivera absolutely refused to remove the portrait and Rockefeller refused to permit it. At that point the great American oligarchs decided to bring art to its knees.